A summer’s day in North Scotland! What the rain sounds like from inside my tent…..
A long one this. But strong winds have kept us off the water again and so I have some time to waffle on! Having exhausted the cafe facilities in Scourie for 48 hours whilst the big winds kept us off the water again, it was finally time to make a break for it. We were up at 6am, gear and tent packed away just as the rain started. That’s the worst. Packing away your stuff wet knowing it’ll be making everything else wet inside the kayak. We had a quick breakfast in the laundry room of the campsite – at least it was warm and dry – 5 Weetabix and some Alpen, cup of tea and a banana. It was just a light breakfast as we hoped to stop after 3 hours paddling for a snack! We chatted to a lovely 70 year old Canadian who was cycling around Ireland and Scotland (wow!) whilst we climbed into our wet paddling gear. We said our goodbyes and launched by 7.45am. No matter how wet or unpleasant the day seems when you wake up, as soon as you are in the kayak, all seems well with the world. It’s just the transitions that are uncomfortable – either getting kitted up in the morning or changed again in the evening. We headed north out of the relative shelter of Scourie Bay and headed towards the mist covered, slightly intimidating, cliffs of Cape Wrath. The sea felt different. A northerly swell was rolling in, typically between 2 and 3 metres, something we haven’t had for a while as we enjoyed the protection of the Isles along the west coast. We actually enjoyed the sensation of being lifted up high and then dropped low into the troughs. The wind rush over our ears picked up noticeably on the way down whilst it was almost silent at the top. 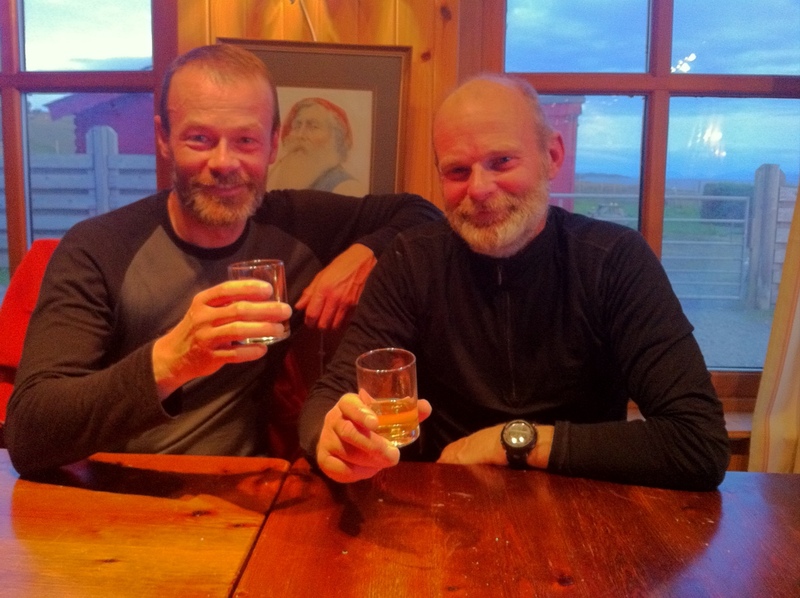 We chatted about what it would feel like to finally get round Cape Wrath. Only one more turn before we head south again. Before we headed for Cape Wrath itself, time for a break on the stunning Sandwood Bay beach. We had to choose our landing spot carefully as the swell converted into quite a large surf. We cleared our decks of maps, camera, GPS and anything else that could be lost if we rolled. We didn’t pop the helmets on but we did deploy the straps on our Tilley hats! After a couple of cheeky surfs we landed and jumped out as quick as we could to avoid getting sucked back out into the surf. A stunning beach and totally deserted. Or so I thought. In the space of the 45 mins we stopped to eat our rolls and heat up our potato cakes, we met 6 people and saw several others who had braved the 9 mile round walk to get to the beach. The sun was out and the wind had dropped – it is times like this that can tempt us to stay off the water for longer than we should! Anyway, Cape Wrath was waiting for us and so we pushed off. The launch was exciting to say the least. Geoff said he was going to wait till the sets died down before he launched. So imagine my surprise we he appeared to launch at the start of a set. He cut a dramatic figure as his 18ft boat soared almost vertical on each wave and slammed down the other side. I counted at least 6 of those. Poor bugger. Meanwhile, learning from his minor timing error I had sat in the shelter of a rock and pushed out once the set had come in. A couple of wet slaps in the face was all I got. Mind you, later I discovered I had forgotten to do up my relief zip on the dry suit (must be my age) and so was uncomfortably damp for the rest of the day. Fate has a way of evening things up! Cape Wrath was only 6 miles away. Strangely we felt a little apprehensive about this one. To add to our mood, the cloud cover increased and the water took on an inky black complexion. As we rounded the Cape itself, we could just see the top of the lighthouse some 210ft above us. The name Cape Wrath comes from the Norse meaning turning point. Mind you it’s English meaning is perhaps more appropriate now. The north going flood tide and the east going ebb, which was just starting, was mixing and fighting with each other for control. The northerly swell and now and easterly swell combined to create quite a turbulent mix. Add to that the severe clapotis (reflected waves off the cliffs) and we found ourselves in easily the biggest and most confused conditions we have experienced so far. At times the sets were coming in up to 5m. Geoff was keen to get a picture with his SLR. So we rafted up for stability once we got past the worst stuff and he got some shots of the lighthouse. Can’t imagine we would have contemplated that a few weeks ago. We pushed on, but were caught in the west going tide as it accelerated towards Cape Wrath. Our paddle speed was down to 1.5kts. Ouch, less than half of what we would normally want. At this rate it was going to take another 4 hours to get to Durness. And of course what had been northerly head winds were now easterlies, but we have come to expect nothing less. After an hour and a half of making slow progress and defending ourselves from incoming waves we seemed to break free from the pull of the stream and our speed picked up to a more reasonable 3kts. The tension began to ease, we began to talk more and admire the incredible scenery and wildlife around us. As we finally rounded Fairaid Head towards Durness we were rewarded with the sound of whale blow hole behind us. Geoff ‘Oddie’ Cater spotted the dark fin of an Orca. We spent a few minutes watching it surface in the evening sunshine, but when we heard a couple more blows behind us and closer, we decided not to risk spoiling the day and paddled on. When we arrived at the campsite, the lighthouse keeper from Cape Wrath was there and asked if we were the kayakers he saw earlier rounding the corner. When we said we were, he passed on a message from Tanya to say she loved me and well done! Oh my word! Tanya had called the Ozone Cafe at the lighthouse, as she thought we might stop there (we didn’t). The owner had told the lighthouse keeper who was staying at the same campsite so he passed on the message and made us a cuppa. What a wonderful end to an amazing day. 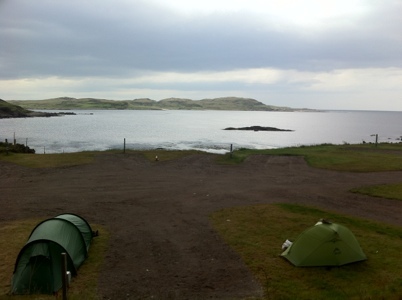 Today and tomorrow we’ll be in Bettyhill, mostly in the cafe eating, as gale force winds are building. But as Harry, one of Geoff’s daughters says, we must not worry about where we think we should be, we must just be where we are. 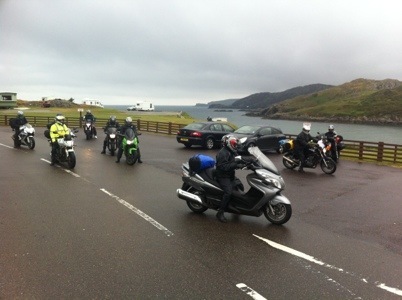 The photos are of the Curvy Bikers (West Coast) – a fun bunch we met at Scourie and the view from our campsite in Bettyhill. Today we paddled 34 miles from Scourie, round Cape Wrath and on to Durness. Winds were much calmer than they have been but the swell was up which made for a lively day. Lots of puffins, skuas and even a couple of orca spotted today! Here’s a short video update from the bearded duo! First an apology if you have been looking at the ‘Our Progress’ and wondering why we’re stuck just off Priest Island in the Summer Isles for the last couple of days. 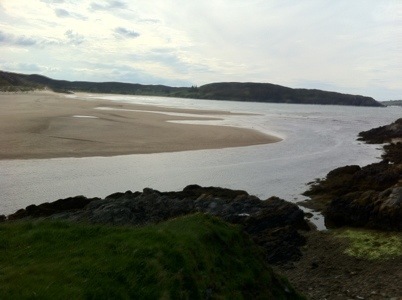 In fact we’re in Durness about 7 miles East of Cape Wrath. The Spot device isn’t always showing our latest position for some reason. However, if you haven’t already, you can always check out Tanya’s daily reports on our progress on our Facebook page “Midlifekayak”. As well as a summary of our day she also provides very useful (and funny) facts about things we’ve seen or places we’ve stayed in along the way! A reminder about one of the reasons why we’re doing this. Geoff and I have found the last few days quite tough. The paddling has been challenging but ok. The wild camping has been amazing too. But we were starting to feel a little different about the expedition. It was a bit difficult to put our fingers on it but talking it through we think we now understand. Yes the paddling is hard and the living rough out of the kayaks can get a bit draining but by far the toughest challenge is what goes in in your head. We have developed many strategies for breaking down the 100 days and 2,500 miles into manageable chunks. We’ve aimed for milestones like getting across the Bristol Channel and into Wales, back into England and in particular getting to Scotland. We have always told ourselves the West Coast of Scotland will be the best bit of paddling and that we’ll not notice the miles. We have strategies for each day too. If its a long crossing we’ll paddle 2 or 3 miles, stop for a drink and a snack and repeat (up to 10 or 12 times often). If we’re hugging the coast more, we’ll try and paddle 10 by 10. That’s 10 miles by 10am. Then stop for a second breakfast and do a second 10. Stop for lunch and then push on for the final stint (aiming for at least 25 miles wind permitting). Then of course talking about all the food we’ll eat when we stop for the evening usually helps too. The psychology has pretty much worked. Except now that we have nearly finished the west coast and still not quite half way, the enormity of the distance left hit us both quite hard for a few days. Up until this point we always took one day at a time and were pleasantly surprised each week to see the progress we made. Geoff likens it to the middle part of a long distance race, the hard miles still to do before the sprint starts. Our sprint starts at Dover. So the last couple of days we have been chatting about the milestones that will get us through the second half. Cape Wrath (no more north) John O’ Groats (heading south again), back into England, seeing my brother Mike and his daughter Hannah, seeing Roger and Salome (and new baby!) and hopefully Tanya in Newcastle and so on….. There are five other very good coping strategies to help us for the next 8 weeks. And that’s the charities that we are supporting along the way. Over the next week or so we’ll say a little more about each charity and the work they do. First up is a lovely note from Liz about her experiences of the West of England Therapy Centre. “My name is Liz and I am a member of The West of England MS Therapy Centre. I want to say a huge thank you to the Midlifekayakers for raising money for the Centre. The West of England MS Therapy Centre has been an essential lifeline for me and countless others over the years. I come here to use the treatments – oxygen therapy and acupuncture – as well as for friendship and understanding. I was diagnosed when I was 29. My MS came on after having my son who is now 3 years old and very active! I find, like many others, that my symptoms and relapses can flare up without warning. This affects my ability to live a normal life. I am a Mum as well as an MS survivor and the Centre helps me to be the best I can be. The oxygen in particular helps me to deal with deadening fatigue and my toddler! Our Centre needs in excess of £400,000 each year to keep providing this vital service to people who have Multiple Sclerosis. We do not receive any statutory or government funding, raising all the money needed ourselves. There is little help available for individuals through the NHS to help manage day to day symptoms so the oxygen therapy, physiotherapy, exercise classes, reflexology, acupuncture, aromatherapy, reiki and counselling is absolutely essential for the growing MS population in and around greater Bristol & South Gloucestershire. It had been a slog of a day, those northerly and north easterly winds have been very persistent. We had left our stunning campsite just north of Applecross around 9am and paddled north through the submarine training area between Raasay and the mainland. Just as we launched a helicopter buzzed low overhead and landed, must have dropped off MOD staff at the control station looking out over the training area. We were hoping we would see a sub surface (but not too close). I was reminded of a very funny joke my dad told me about a wireless operator on board a sub and a pair of cuff links. I told it to Geoff and we both giggled, but sorry, it’s Cert 18 rated I’m afraid. But ask me next time you see me. After the first couple of hours the wind picked up again and as usual was in our faces for most of the rest of the day. But no complaints, the gorgeous scenery and wildlife make it all worthwhile. Whilst we have seen hundreds of seals on this trip we are always pleased to see them. They often appear behind us as we paddle by, so sometimes we’ll paddle backwards to catch them out and get a closer look and a photo. Geoff has become the Bill Oddie of the expedition having now spotted 3 sea otters and 2 incredibly rare sea eagles. The landscape has definitely changed since we paddled north of Skye. A little more rugged, fewer trees, and less protection from the Atlantic swell from the islands. We were aiming for Melvaig. A small village just north of Gairloch. But first we needed to stock up on provisions. The rate at which we are eating and depleting our stores is quite scary. We saw a large camp site at Big Sand and guessed that it must have a shop, it would be the last we’d see for a couple of days. It did! As 27 miles appeared on our GPS we could see Melvaig. We could also see the massive bolders on the beach. From a distance it looks like shingle but as you get closer you realise it is impossible to land on. Fortunately a brand new slipway had been built so we were able to land relatively easily and pull the kayaks up beyond the high tide mark. Once we had cleared the sheep poo away from a nearby patch of grass we pitched the tents and got changed. Imagine how jammy we felt when we walked up a steep path 100 yards and found the only pub for miles around. The Melvaig Inn was superb. Run by the ex sound man for Pink Floyd and Mark Knoffler, it has a very quirky and friendly feel to it. So 1000 miles done and nearly half way!